Tidying Up – Live. Simple. Good. As a wedding gift we received a gift card to Barnes & Noble. It took us 5 years to go and actually buy books. Almost immediately my husband picked out a historical book (I think on Ninjas or something like that) and there I was about to have a panic attack because I had to find a book… that was worth the money and I wanted to keep (plus I was 7 months pregnant and could barely bend down to look at anything on the low shelves). Finally I found a mystery to try. We bought our books (I’m not thrilled at all because I will probably find it at a yard sale during the summer for a quarter), we go home, the next day I check the same book out at the library and read that one. I didn’t return the book in time so now I have a brand new copy of a book I didn’t read and am hoping to pass on as a future gift (don’t worry… it was good). The point of that (probably unnecessary) story was – I love used bookstores way more – BUT at a Christmas gift exchange I went after a gift card to a new local bookstore/ coffee shop. I have been reading more non-fiction so I though there was hope – I knew I had to find something good that I would want to keep! Thankfully my husband is a book lover as well so we made the gift into a date. We dropped the boys off with MeMa and enjoyed a fun search of books while sharing a White Chocolate Maple Spice latte… mmmm! The bookstore was small but surprisingly had a very good selection. I was impressed! That same day my mom had mentioned a book she wanted to read and low and behold there it was sitting on a shelf at the entrance. The book is called, “the life-changing magic of tidying up” by Marie Kondo (the title of the book really is in lowercase form). I know, I know… Sounds a little dumb for “The Book” I was considering buying but I want to be honest… I need help in this area of my life! My two little boys are both under the age of 3. When it comes to keeping my home neat and tidy this rarely happens unless company is coming over. It’s not horrible but it still is a far cry from how I want my home to be and feel on a regular basis. After a quick flip through I knew this was the one – the book I would be taking home gleefully. I spent my next day reading the entire thing. 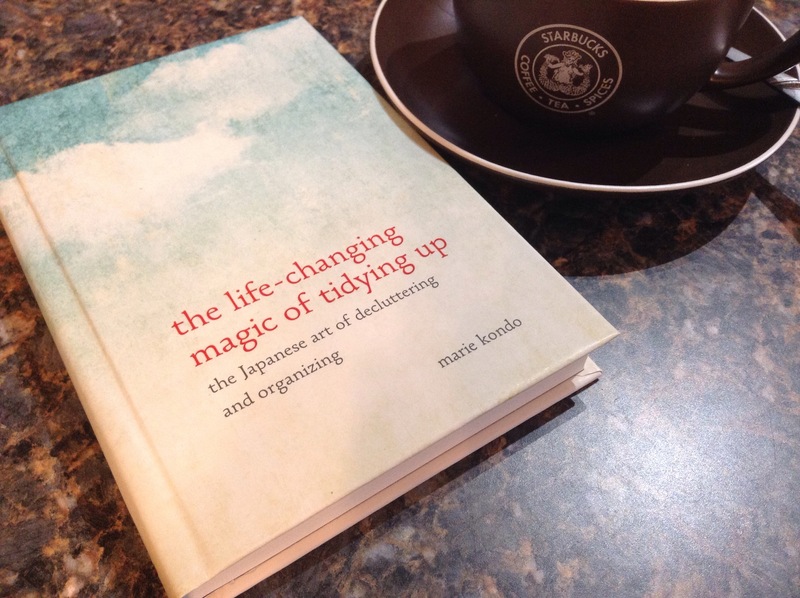 The book explains “the Japanese art of decluttering and organizing.” Kondo walks you through the process of de-cluttering your entire home by category. Starting with clothes, books, papers, etc. I don’t want you to spend your entire day reading one long winded post so I will stop here and keep your informed of my progress with some scary honest pictures. 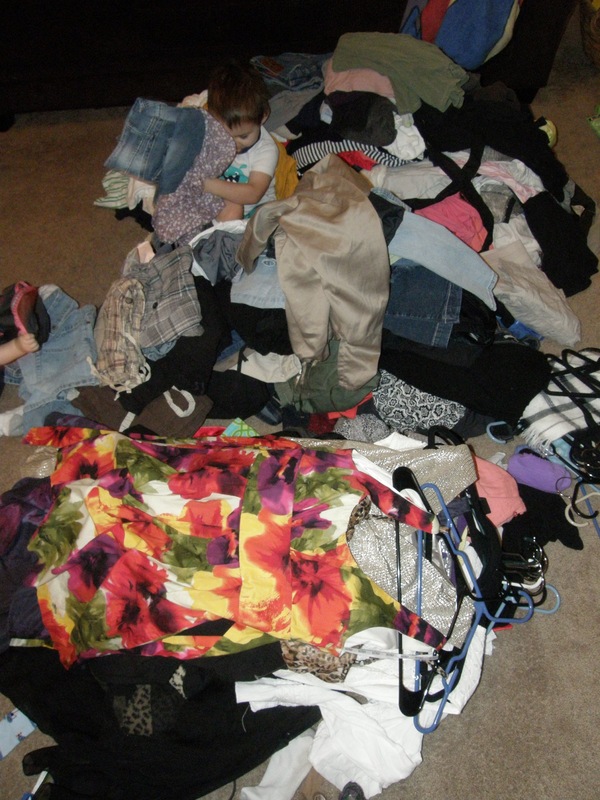 Here is a preview of all the clothes I had to go through… wait until you see the finished picture and how many bags of clothes I got rid of! The point of this post was to share with you how much I want YOU to read this book too. It’s been so worth it in such a short amount of time! If you care to join me in this process please feel free to share your progress with me. We will have simpler homes that are easily manageable and tidy as well as realizing we don’t need so many things! Let us Live Simple and Live Good!